The word "monsoon" comes from the Arabic "mausim" which means "a season". 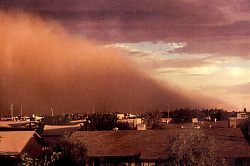 The start of the season occurs, in Phoenix when the dewpoint temperture averages 55°F three days in a row at Sky Harbor International Airport. UPDATE for 2008; the National Weather Service has decided to change the way it defines the start and end of our Monsoon, the NWS has decided to use the specific dates of June 15th to September 30th, instead of the traditional dewpoint method. The season occurs due to a seasonal wind shift caused by the formation of the Bermuda High over the Texas Gulf Coast. The Bermuda high causes the upper level winds over the desert Southwest, to shift from the normally dominate westerly direction, to a more southerly to southeasterly direction. This wind shift leads to a increase in mid and high level moisture from the Gulfs of California and Mexico. This is further enhanced when the combination of a high pressure system over the 4 Corners region and the Arizona heat causes the formation of a thermal low (heat low), this thermal low usually forms near Yuma. This setup imports additional low level mositure from the Gulf of California sometimes refered to as a gulf surge, which tends to enhance the storms. During the height of the season mid August the storms can produce beautiful lightning displays. Like the one,(pictured above), that ocurred in August of 1989 over Tucson, Arizona. Please check out the Pepper Ridge North Valley's Live Lightning Page which also lists proper Lightning safety rules. 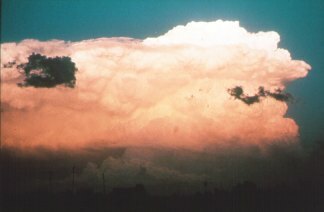 On a typical day during the Arizona monsoon, the thunderstorms tend to develop first in the early afternoon over the higher mountains and the Mogollon Rim. Rain cooled air from these thunderstorms, known as outflow, moves down from the high country and into the deserts. Acting like a small scale cold front, this outflow causes the hot and moist desert air to rise, producing new thunderstorms. One of the most favorable situations for a large scale thunderstorm outbreak in Phoenix is when outflow boundaries approach from the Mogollon Rim and southeast Arizona simultaneously. 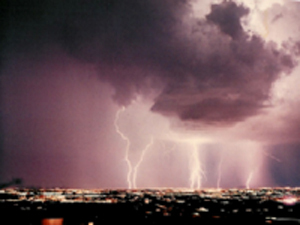 Over the higher deserts, storms generally occur during the mid and late afternoon, while activity is most prevalent over the lower deserts during the late afternoon and evening. On most days, thunderstorm activity ends altogether by around Midnight or 1:00 AM. As these thunderstorms decay, they can produce strong damaging winds with severe wind gusts and downdrafts or even microbursts. Severe thunderstorm wind gusts are defined as those that equal or exceed 50 knots (57 mph). Occasionally these thunderstorms can even produce small tornados. More typically the thunderstorm is proceeded by a strong gust front, with strong winds and blowing dust, this can be followed by localized heavy rainfall and small hail, which can lead to localized flash flooding especially in flood prone areas. All motorists are encourage to avoid driving through flooded low lying areas and running washes during these dangerous thunderstorms. The flood waters may have eroded away the roadway and can be fast moving and are dangerous. Because of the local nature of the storms, rainfall amounts accross the valley vary widely. Typicially Sky Harbor receives about 2.65 inches of rain during the monsoon season. For staticial purposes the rainfall for monsoon season is measured from Jun 15th to Sept 30th, and each day with a dewpoint of 55°F or higher is condsidered a "monsoon day". The average start of the season is July 7 with a ending date of Sept 13th and average number of Monsoon Days is 56. These are main factors that can be easily be measured and allows us a way of comparing one year to another. I have included the rainfall totals and averages for the monsoon season recorded at the Pepper Ridge North Valley Weather station. You can also look at the, "Monsoon Dewpoint Tracker", Which is located on the monsoon rainfall page this shows the temperature and dewpoint temps over the last three days. This is a helpful guide in judging the start of the Arizona Monsoon season, in Phoenix. You can watch this page for the steady increase in humidity and dewpoint as the Monsoon approaches. When the dewpoint tempature averages 55°F or higher for three days in a row the Arizona Monsoon Season has officially began. For more infomation on the Basics of Arizona Monsoon refer to our new Monsoon Basics page or to the N.O.A.A Phoenix web site.